Sundance Spas - Circuit Board 2-PUMP LED 2014, CIRC, LX-15 Sweetwater - 6600-726 Replaces Part Number. AI # SD6000-167 / MFG 6000-167. AI# SD6600-288 / MFG 6600-288 PCB:780 R3.56 and LX-15 with Circ. AI# SD6600-088 / MFG 6600-088 PCB:780 R3.56. Replaces: 6600-088 Replaces: Revisions: R6.16, R6.17, R3.54, R3.56. Used on the following spas: Jacuzzi J-320, J-330, J-340 as well as Sundance 2003+ Palermo, Bahia, and Cayman. Jumper settings are as follows: Jumper 1 - On - 15A, Off - 50A Jumper 2 - On - 2 pumps, Off - 1 pump Jumper 3 - Used along with Jumper 2 Jumper 4 - On - Celsius temp display, Off - Fahrenheit temp display. 2002+ Jacuzzi Circuit Board for. J-300 Series LED Circuit Board 6600-288 is for following models. 3.2007 J-325 (240 Volt Model). As of 2007 the J-300 Series are all LED models. 2007+ J-365, J-355, J-345, J-335. 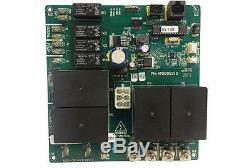 This board (6600-288) is for circulation pump systems (see 6000-125 for circulation pump). Comes with a Series 3.56 chip. If your circuit board has a Software Chip that begins with a 3, then this is the correct series board. Sundance has revised this chip several times, we send you the board with the current chip of 3.57. If you have an older board without a Circulation pump, then you need a board with a Series Chip that starts with a 5. If you have an older board WITHOUT a Circulation pump (see 6000-125 for picture of circulation pump). Then you need a board with a Series Chip that starts with a 5. This would be a 6600-287 board. ALL 6600-287, 6600-087 boards (without circulation pump logic, Chip 5.54)and 6600-288, 6600-088 (with Circulation Pump Logic, Chip 3.56 or higher)are identical but use different micro chips. Our company name is Pool Spa Supplies, and our reputation is exemplary. Thank you for your business. Looking for hard to find pool and spa parts? Unsure of what you need? Give us a call, we can help! Why choose POOL SPA SUPPLIES? Because with 25 years in the pool and spa service industry, we know what it means to provide good customer service. Our technicians will even help you program your spa control. Tom can rattle off part numbers and replacements faster than you say POOL SPA SUPPLIES. We sure don't get to talk about pools and spas when we go home after work, as that could bore our loved ones. The item "Sundance Spas Circuit Board 2-PUMP LED 2014, CIRC, LX-15 Sweetwater 6600-726" is in sale since Friday, August 05, 2016. This item is in the category "Home & Garden\Yard, Garden & Outdoor Living\Pools & Spas\Other Pools & Spas". The seller is "poolspasuppliesonline" and is located in Houston, Texas. This item can be shipped worldwide.